When it’s time for your child to leave the nest and you need to find a day care center, finding one you trust can be a challenge. Daycare and preschool offer many benefits, but only if you find an environment where your child can thrive. The team at Creative Learning Arts School does everything we can to ensure that we provide that environment, with art and music classes for kids, language learning, and more, but we understand that finding the right curriculum is just the first step. In today’s post, we’ll be going over what questions you should ask every potential day care center before you register. We want to help you find the perfect daycare and preschool as much as you do! Read on to learn more, and contact Creative Learning Arts School today to ask us for more details about our program. How Do They Screen Adults Picking Up Your Child? The idea of a stranger being able to pick your child up from daycare or preschool is not a comforting one. Press any potential day care center to explain their pick up policies so you can rest assured that your child will be safe. If someone who is not you or another established guardian comes to pick up your child, what kind of questions or screening will they face? Does the center check I.D.s of anyone who isn’t you before they release your child to their care? Decide what policies you would feel comfortable with and make sure you find a day care center that meets or exceeds your expectations. What Are Their Standards for Child Supervision? You are investing in a day care center so someone can look after your kids when you can’t. That means someone should always be looking! Double check that there will always be a caregiver supervising the kids, even during naptime, so you can have peace of mind that nothing serious can happen out of sight. How Often Do They Clean Toys and Surfaces? Any place where many people spend a lot of time together is going to expose your child to a wide variety of germs. A good day care center will do what they can to limit this exposure, however. Learn how often they clean toys, floors, bathrooms, and other surfaces, and ask what they use to clean them. What Is Their Policy on Sick Kids? One of the most important questions to ask to ensure your child’s health is what every daycare’s policy is on sick kids. At what point will they ask a child to stay home? What do you need to do if you are keeping your child home? Do They Provide Snacks? What Do They Provide and When? Spending the day away from home means your child is going to get hungry. Do you know what your day care center will feed them? While you are deciding on a preschool or daycare, ask what kind of snacks they provide and when. It may sway your decision if one center only offers crackers and PB&J sandwiches while another focuses on fresh fruits and veggies. This is also important to know if your child has any allergies or food restrictions — are they willing to accommodate those needs? Will you need to pack snacks yourself? What Is Their Policy on Electronics? Kids all over the world are getting exposed to more and more screen time. Every parent has a different opinion on it, but you should make sure that your day care center sticks to your standards when it comes to electronics. We doubt anyone wants their child to sit in front of a TV all day! How Do They Discipline Misbehaving Kids? One question you absolutely do not want to forget is how a potential day care center will handle unruly kids. Do they use timeouts? Do they concentrate on good behavior with color or star charts? 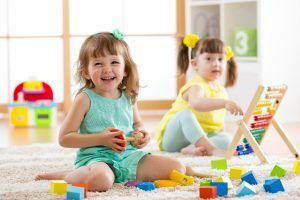 It’s unlikely that you’ll get any truly nasty surprises if you don’t establish your expectations early, but this is one criterion that can help you determine whether a day care center is right for your and your family. We hope today’s post helps you feel more prepared to tackle the challenge of finding a day care center for your kids. If you’re looking for a place that puts the engagement of your child first, then look no further than Creative Learning Arts School! We have locations throughout the Bethesda area, and we believe in doing all we can to help your child learn and grow with their interests. Contact a member of our team today to learn more or register online!